The SDoT Diode from INFODAS GmbH is the only software-based data diode in the world that enables critical and classified systems to securely exchange data unidirectionally between differently classified domains. Independent testing laboratories in cooperation with the German Federal Office for Information Security (BSI) have now confirmed the very high level of security and granted the SDoT Diode approval to GERMAN, NATO and EU SECRET. With a data throughput of up to 9.1 Gbit/s, it is currently the fastest diode solution on the market approved for SECRET. Infodas presented the SDoT Diode to an international audience at the RSA Conference in San Francisco (March 4th - 8th 2019). Infodas is proud of this achievement and would like to thank all involved parties for their trust and continued effort. Prof. Udo Helmbrecht, Executive Director of the European Network Information Security Agency (ENISA) and Ammar Alkassar, State Commissioner for Strategy and Chief Digital Office at the State of Saarland personally congratulated Thorsten Ecke, Managing Director infodas at the German Pavilion at RSA Security Conference in San Francisco. 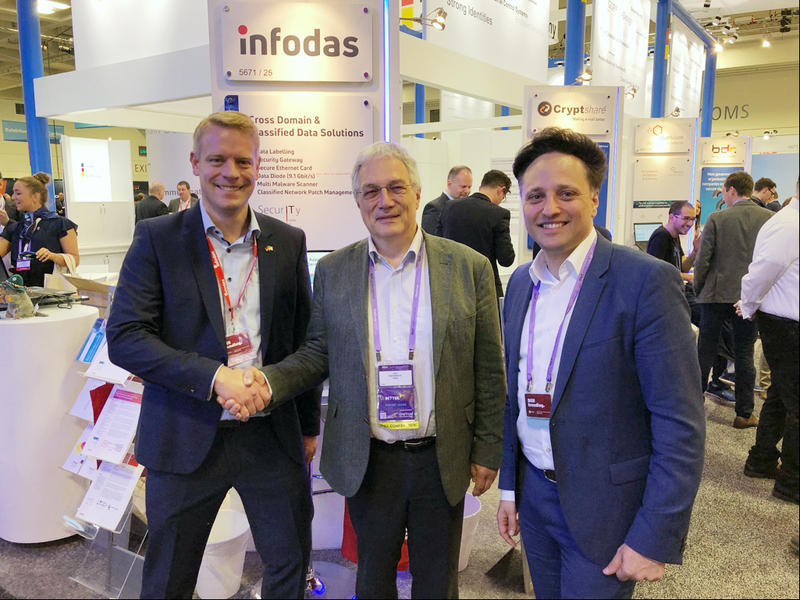 infodas, is a German pioneer in cybersecurity solutions for the public sector clients since 1974 that works closely with the German Federal Office for Information Security. The SDoT (Secure Domain Transition) products solve the challenge of military, intelligence or critical infrastructure professionals that need to connect and protect IT systems; or share and protect classified data across domains from UNCLASSIFIED to SECRET. SDoT products are used in the most demanding, mission critical and sensitive operational environments around the world (e.g. navy vessels, drones, mobile data centers in the desert, weapon systems, air traffic control, security operation centers and critical infrastructure (ICS/SCADA)). In today's data driven world, organizations and systems collect, process and share data across multiple domains of various classification or criticality levels. Large amounts of data need to be transferred in real time with the smallest latency possible. This data exchange and connectivity introduces differing levels of risk. However, isolation of critical networks prevents taking advantage of sharing or receiving data. Despite their current level of sophistication, firewalls are designed to enable two-way data exchange and fail to establish robust network separation. In comparison, data diodes ensure one-way data transmission, protecting critical networks or data sources from cyber threats. This makes data diodes ideal for sharing data with highly classified domains (e.g. satellite pictures, positioning data, telecommunication data), data replication, sensor and system state monitoring or backup (e.g. machine/sensor data for predictive maintenance). Data diodes available on the market today, still use fiber optic cables for one-way connectivity. This however introduces issues such as lower speeds, lack of data receipt acknowledgements or the need for a proxy server. In comparison, the SDoT Diode overcomes these challenges of traditional data diodes and extends available use-cases for customers. The SDoT Diode is available for non-EU and NATO countries.